This striking still-life, which takes its curious title from the Yalta Conference of February 1945 when Churchill, Stalin and Roosevelt reached agreements on the future partition of Europe, is one of two allegorical pictures that Cedric Morris painted during the Second World War; this to mark its end, while the other, Crisis, painted in 1939 and marking its beginning, consisted of a tree on which birds of various sizes perched and was intended to stand for the leading European politicians of the moment. The humorous inner meaning of Yalta, however, as Richard Morphet remarks in his Tate Gallery retrospective exhibition catalogue - although not a secret has not been recorded - Morris commenting only that 'The big red pimento is Stalin, the big green ones are Roosevelt and Churchill, and the carrots...' Meanwhile, leaving inner meanings to one side, it is possible, as always in Cedric Morris’s painting, simply to enjoy the startling intensity of colour and directness of compositional design he uses to bring such an apparently mundane subject so vividly to life. As commentators have observed, this had much to do with Cedric Morris’s passion for plants and gardening (a 'dirty-handed' gardener was one description of him.) and he himself once remarked how 'there must always be great understanding between the painter and the thing painted otherwise there can be no connection and no truth........This might be called "vision"and reality as opposed to realism. 'To this must also be added the knowledge that Morris was also a considerable gastronome as well as a gardener and something of that keen anticipation of vegetables as food is also inherent here. 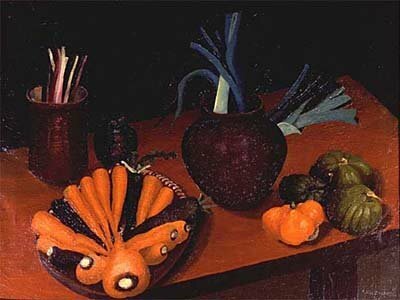 Finally vegetable still-lifes, it is worth noting, started to become a particular feature of Morris’s work at this time, partly due to wartime requirements and partly also, due to the establishment of a garden at Morris’s new home at Benton End near Hadleigh in 1940, when vegetables were used to help clean and purify the soil. They were to remain a feature of his paintings for many years however, and in his garden too where they came to play a decorative as well as a utilitarian role, with the vegetable beds often being edged with roses, lilies and sweet-peas.